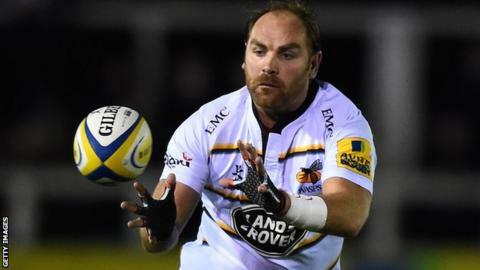 Former England fly-half Andy Goode is to retire after failing to recover from persistent injuries. Goode, 35, played 17 Tests for his country and joined London Irish in the summer after leaving Wasps. The former Leicester, Saracens and Worcester back is the second highest points-scorer in Premiership history. "I can honestly say I've loved playing for every team and I feel immensely proud to have achieved what I have at each club," he said. Goode joined Irish with the intention of playing one more season in the Premiership and Europe. But, following consultations with the club's medical staff and his own physician, he will call time on his playing career and leave the Exiles. "I'm really disappointed I can't continue my career at London Irish and I've really enjoyed my short period with them," Goode said. During his first spell with Leicester, he was part of the side which won four successive Premiership titles and the European Cup twice. He also spent time playing for South African Super Rugby side the Sharks and with Brive in France's Top 14.